Everything would be fine if people would just leave Milton's Swingline stapler alone. 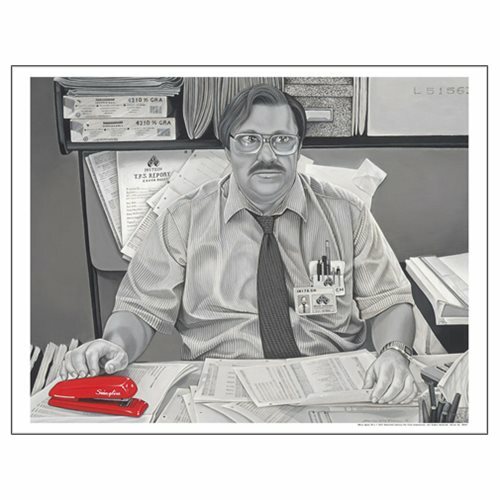 If your boss makes you want to burn down the building because he keeps moving your desk or forcing you to use subpar staplers, show him who he's messing with by hanging this stylized print of the unsung hero from 1999's classic movie, Office Space. From artist Damien Friesz comes a black-and-white image of Milton at his desk, complete with his red Swingline stapler. A limited edition of 200 hand-numbered pieces, each print includes a certificate of authenticity. Measures 22-inches wide x 17-inches tall.